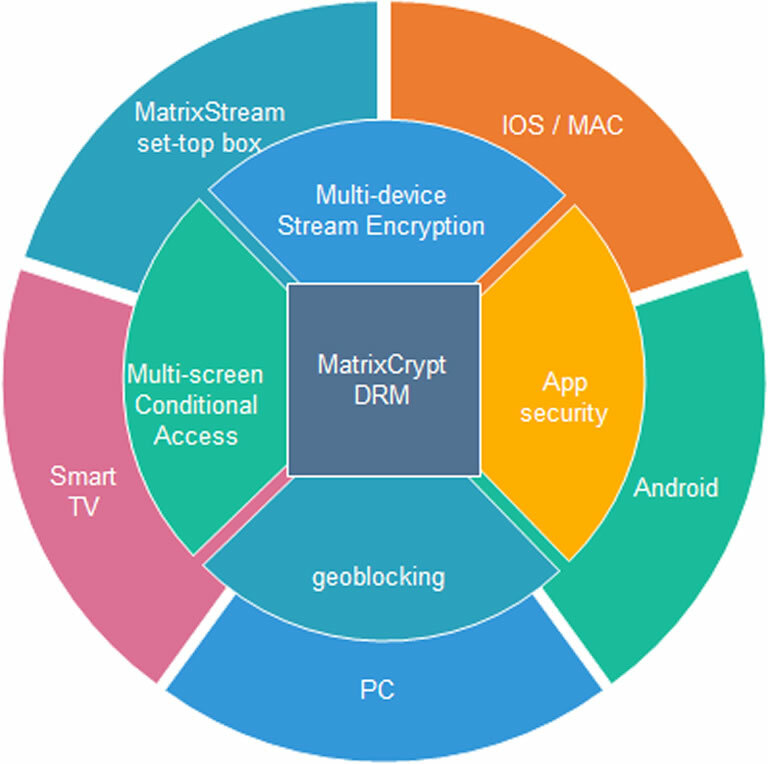 MatrixCrypt Content Protection - MatrixStream Technologies, Inc.
End-to-End Content Protection for Live TV and VOD The MatrixCrypt DRM (Digital Rights Management) is a complete solution to protect live TV and VOD streaming for ITM (in the middle), OTT, and IPTV operators. MatrixCrypt is a combination of CA (Conditional Access), video packet encryption, instant watermarking, and analog content protection designed to give IPTV operators all the tools required to protect content against unauthorized viewing. IPTV operators will never have security problems like smartcard duplications that’s common with satellite and cable TV systems. Next Generation Digital Rights Management MatrixCrypt supports advanced pay per view and subscription billing options for content by using user profile packages. This feature is tied to the MatrixStream billing system. The operator can set number of hours the client can view a video. MatrixCrypt will automatically cut off access if the customer viewing time has expired even if they are in the middle of watching a live or video on demand stream. Multi-screen DRM and CA (Conditional Access) support MatrixCrypt supports PC, STB, Mobile, or connected TV in a single unified DRM whether it is for private multicast network or over the public Internet. MatrixCrypt CA has the flexibility to allow multiple people and devices in a household to watch videos at the same time or simply disable simultaneous video watching all together. MatrixCrypt gives operators complete control over how they define business rules for IPTV. Mobile network and LDAP support MatrixCrypt can automatically detect each mobile device to allow automatic login without users entering any id or password if the user is a paid customer. This will allow the operator to quickly deploy to large amount of users without massive security headaches. If an operator already has user’s profile on LDAP servers, MatrixCrypt CA and DRM can easily authenticate against operator’s LDAP servers without creating separate user profiles. Industry Standard Digital Content Protection MatrixCrypt supports industry standard AES 128 bit encryption, CMGS-A and HDCP digital content protection on all of its IP STBs (Set Top Boxes). The HDCP protection is an optional add-on for all MatrixStream IP STBs. Viewer Audit Report The MatrixStream MatrixCrypt DRM system provides complete viewer audit reports for IPTV operators. Operators can generate complete report on user activities for security audit. In addition, operators can use the data for marketing and usage reports.